Chris Brown has returned to the stage. The singer headlined Power 105.1's Powerhouse '09 performance at the Izod Center in East Rutherford, New Jersey, on Tuesday night, according to MTV News. In his first major performance since pleading guilty to once count of felony assault against his ex-girlfriend Rihanna in June, Chris reportedly followed openers The-Dream, Fabolous, Day26, Trey Songz, Keri Hilson and Mario with a set including his new single, "I Can Transform Ya," as well as "Wall To Wall," "Gimme That" and "With You" before closing with "Forever." 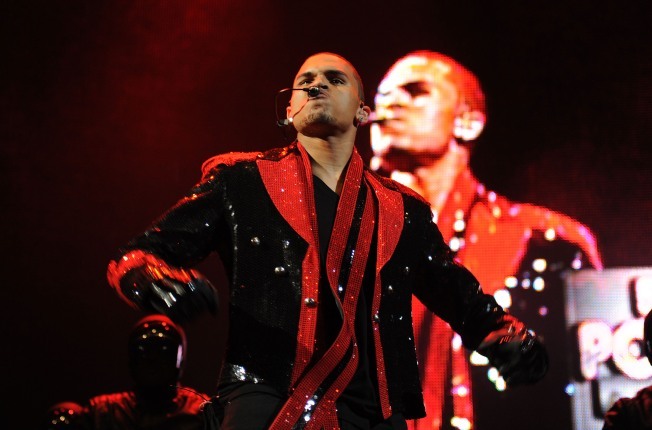 Chris took the stage in a sparkling red and black outfit reminiscent of his idol Michael Jackson's "Thriller"-era style, an homage to the late pop star. The set reportedly featured "high-powered dancing," with Chris showing off his moves alongside backing dancers in motorcycle helmets. Other stars at the performance told MTV News they were glad to see Chris back on stage. "Chris is a performer. In spite of all that's been going on in his personal life, he's gonna get out there and perform," Trey Songz said. "I'm confident in that. As a friend, as a brother, I wanna see him go out there and shut it down. I believe everybody deserves a second chance. In God's eyes, none of us are perfect, and he forgives us every day. He deserves a second chance, and I commend Power 105 for giving it to him." Producer Polow Da Don also praised Brown's return to the stage. "Excuse my French, but that muthaf***in' boy killed that s***!" he said. "The energy was crazy. You could tell that's something that's missing in the game. He's the absolute truth. He's the future."